A Follow Spot: Up Close and Personal with Kevin Paul Wickart on "Mauritius"
Up Close and Personal with Kevin Paul Wickart on "Mauritius"
Heartland Theatre's production of Theresa Rebeck's "Mauritius" opens two weeks from tonight. To get an inside look at the show, I put actor Kevin Paul Wickart (shown below), who plays Philip, the owner of a scruffy stamp shop, under the microscope. Hi, Kevin! Thanks for chatting with me. Congratulations on being cast in Theresa Rebeck’s “Mauritius” for Heartland Theatre. Had you heard of the play before the audition notice went up? Thank you, Julie. No, I hadn't heard of the play before. I had done some research on the show that Heartland had originally been looking at, and later noticed the change in the schedule. I kept in touch with (i.e. "hounded") Mike and Gail Dobbins to see about getting a review copy of the script, so I was familiar with the play before auditions were announced. You’ve described “Mauritius” this way: “The discovery of a possibly-valuable stamp collection brings out the absolute worst in five people.” What can you add to that? What is “Mauritius” really about? And what does the title refer to? That was my "one breath" synopsis for Facebook. The slightly longer version is: "Mauritius" is about two half-sisters whose mother has passed away after an extended illness. In going through her belongings, they find an old stamp collection that may contain the Holy Grail of stamp collecting--two incredibly rare stamps from the island country of Mauritius. When one of the sisters attempts to have the collection appraised, three men begin plotting to get hold of it. Rebeck has taken some flak for supposedly writing “Mamet Lite” with this play, with some comparisons to “American Buffalo.” What do you think about that? I think that some of the comparisons to Mamet are inevitable, given the use of profanity in the show. Like Mamet, Rebeck uses profanity to give her characters a measure of contemporary verity, rather than for shock value. I'm not sure what comparisons to Mamet's "American Buffalo" can be--or are being--made, other than use of the device of collecting and a bunch of people behaving badly. In plays of this type, there is always a "McGuffin," the thing that is sought by the characters, and the seeking of which invariably reveals their true natures. Whether that McGuffin is a stamp collection, coin collection, or the Hand of the Maiden Fair, the core plot is that of The Quest. What remains is the question of what each character is willing to do to get it. So...yeah, there are similarites. How does your character, Philip, fit into things? How can you describe him? Philip is a stamp dealer and expert, in whose store much of the play takes place. He has a history with the character of Sterling; though their views regarding stamps are quite similar, there is an "unpleasantness" between them. As you go through rehearsals, what are you enjoying most about the play? There are so many things! As an actor, I'm really enjoying the process of finding my character's motivations and voice, and seeing how he plays out against the other characters. And, of course, I love being part of a show that includes new and old friends. I’m going to guess that the fight rehearsals are your least favorite part, given your description of being “slammed, punched and pummeled repeatedly about the head and body.” Or maybe you enjoyed that? Who knows? Actually, I am loving fight rehearsals! I can only imagine what it'll all look like from the audience, but from my perspective it's completely awesome! What is it like working with director Sandi Zielinski and the rest of the cast? Have you worked with Andrew Head, Sarah Stone Innerst, Michael Pullin or Nancy Sultan before? I would imagine a lot of snap and crackle with those scene partners. Working with Sandi is amazing. She continually challenges us to look deeper into our characters, to keep us from getting complacent. Also keeping me on my toes is the fact that I'm working with a group of talented and experienced actors. I worked--and sang and danced--with Sarah in "The Pajama Game" at Community Players, and I worked with Michael as an actor in last October's Discovery Walk at Evergreen Cemetery. Nancy and Andy were new to me, but we're all blending quite nicely. And yes, there is a lot of "crackle" in some of the scenes. Although I have known you for a while, I realized I don’t actually know much about your past theater career or non-theater career, for that matter. So when did you first step on the stage and who or what were you playing? Hmm...easier asked than answered, I think. Assuming you mean local stages, my first foray was as Mr. Meeker in Heartland's production of "Inherit the Wind" at the Historical Museum in 1990 or thereabouts. I actually did mean your first role ever, and now that I know that’s hard to answer, I’m even more intrigued. Was it traumatic, like you were a Goose A-Laying in a Christmas pageant? Or a ham, like Scout in “To Kill a Mockingbird”? Or is it just that you’ve done so much theater that you really can’t remember? Maybe you were Cousin Oliver on “The Brady Bunch” and you don’t want to reveal your secret identity? Ah. Well, then...my first role that I can recall was that of Baby Bear in my second grade production of "Alice in Christmasland." How long have you been in Bloomington-Normal? I came downstate to attend ISU in 1977, and pretty much forgot to go back home. What did you study at ISU? I studied a little Physics, a little Computer Science, and some Psychology. All good things for keeping your acting honest and your singing on the beat! And what do you do when you’re not on stage? I've been known to put some time in as a Bank Technician at State Farm Bank. In my copious free time I relax at home with my family, hang out with friends (most of whom are theatre folk), or build model rockets. 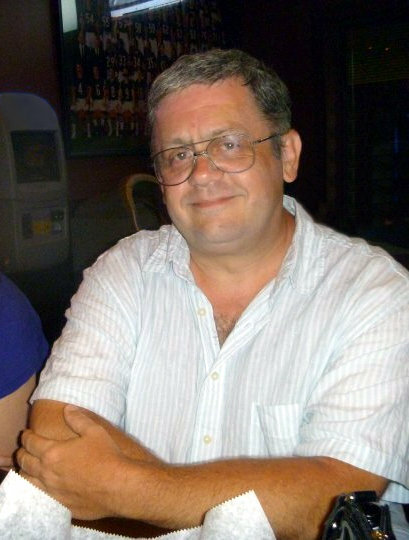 I know you have performed locally in both musicals (“Titanic” at Community Players and “HMS Pinafore” for Prairie Fire) and straight plays (“Don’t Forget to Play My Numbers” at Heartland last summer), plus you directed a Neil Sedaka revue for Prairie Fire Theatre. Do you have a favorite role you’ve played thus far? How about a role you’d love to play if you were running the world? My favorite role so far was my debut with Community Players, playing seven characters in their production of "The Woman in Black" in 2008. As far as a role I'd love to play (if I were running the world), I think I'd have to go with something from Shakespeare--Hamlet or Puck, perhaps. I love the language, the poetry, and the intensity of his characters. Back to "Mauritius" as we close out here. How is “Mauritius” different from what you’ve done before? Mainly, it's my first use of violence and profanity on stage. Considering the number of shows I've done over the years, I find this rather amazing. 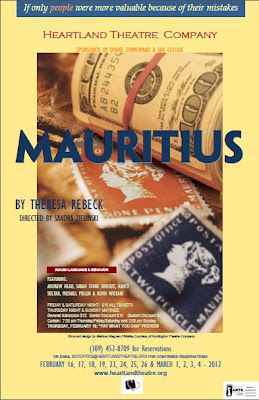 And, finally, what (aside from the violence and profanity) makes “Mauritius” a do-not miss for audiences? We have a top-notch cast and crew, the characters are complex and being fine-tuned every day, and the script is excellent and fast-paced, having been crafted by an award-winning playwright and screenwriter. All the elements are there for a top-level show, under the guidance of an amazing director. All we need now is an equally fine audience. "Mauritius" opens at Heartland Theatre on February 16th, with performances running through March 4. For reservation information, click here. A pleasure to read! I look forward to the show. Loved reading this, good interviewer and interviewee! Kevin, you can "hound" us anytime! Thanks for all you do for Heartland! Thanks for stopping by, Gail. Note to others who read this: You, too, can comment with the Anon option. I am Kathryn Grant the author of The Good Counselor. I read your review on Amazon. How kind of you!!!! I am thrilled that you liked my play and grateful that you took the time to put your sentiments in writing. Please contact me through my website, Kathryngrantplaywright.com anytime with news of your work, etc.